Homeowners are sometimes in a dilemma on the type of mower they should get to keep their lawn looking the best. The push mower is for those after something cheap or one to help them stay in shape. There are others that may want to be done with the lawn mowing the shortest time possible. Here are a list of the top riding lawn mowers you can consider. If you have a big lawn, then a push mower is probably not for you. It is not worth spending hours on end doing the same chore. That would mean taking a significant portion of your rest time over the weekends which is not always appropriate – you need the rest to recover from a busy week. The riding mower is a pretty comfortable option that ensures you are taking the shortest time possible to complete the mowing. They are easy to use as all you need to do is sit and drive through the unkempt grass leaving it looking decent. Push mowers are the cheapest and most common types in most homes. They are economical compared to the riding mowers as they do not require gas and the cost of maintaining them is at the bottom of the pile. The push mowers have a tiny bag at the bottom to store the clippings. However, you will need to keep emptying it to avoid choking the engine. This pushing and frequent emptying of the bag can prove tiring and monotonous. Gas push mowers produce emissions and are not quiet in any way. The electric models are higher-priced and usually, come with limited run time. However, with push mowers, you will break some sweat and take some time to finish the patch. They are only ideal for small, flat yards. But don’t be too quick to dismiss them. A riding mower may have a reasonable turning radius but struggle to negotiate particular features and obstacles. This is where the push mowers prove crucial. Riding mowers may be a good choice in steep areas. However, they can be frightening in extremely steep areas. The risk of tipping over may be great leading to an emergency situation. They are however the best choice where there is need to push through some weed and brush. The push mowers may, however, struggle in such areas. Then there are self-propelled mowers that do not need the intervention of your muscle-power. They are pretty convenient, but there are places they will not be effective. The self-propelled varieties can indeed be helpful in hilly patches and tall swathes. Unfortunately, you cannot use them when the motor is off. The self-propelled gas mowers are noisy varieties and produce emissions. The electric types are not any better as most of the battery power is used propelling the wheels. As a result, you may not be left with any power to complete a patch. Lawn tractors are a big step up on riding mowers. They come with broader cutting decks and more powerful engines. Some of them are even more versatile allowing particular attachments such as the snow throwers and spreaders. Lawn tractors also pack up more features such as cruise control, high back seat, and four-wheel steering among others. One variety common among landscapers and golf courses is the zero-turn mowers. They have a high level of precision and are faster. However, learning the lap bar may prove challenging. Zero-turn mowers are ideal for extensive and flat areas. They are designed to quickly mow around obstacles such as trees and ponds. Zero-turn mowers are a bit pricey compared to the riding mowers. Some people just discard or burn the clippings, but this is not ideal. Typically, you should create a compost pile and throw the clippings. Several months down the line, these clippings transform to organic fertilizer you can use in your vegetable garden. Avoid mowing when the grass is damp as it can easily cause the deck to rust. Make sure to remove all the wet grass if it is a must you mow. Depending on the type of soil in your area, sharpen the blade from time to time. Blades tend to dull more rapidly in areas with sandy soil. And avoid cutting the grass too short so that overcome drought. Cutting it too short leaves them vulnerable and can quickly dry. Don’t leave the mower outside in the weather if you want it to serve you for longer. Put in the garage or store to avoid rusting and ensure durability. 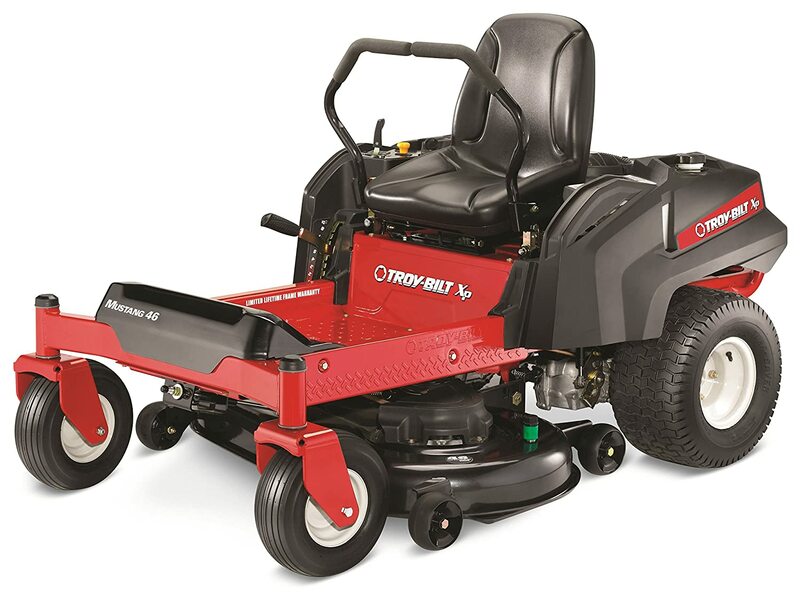 The mower is equipped with a powerful 24 horsepower engine that easily attains 7 MPH. Its 46-inch cutting deck comes with eight adjustable height settings you can choose from. Has a 360 maneuverability and electric power take-off saving you time. This is a zero turn mower meaning that it can quickly mow around the barriers in your yard. The mower also comes with fast-attach accessories making the mower truly versatile. Briggs & Stratton are a respected brand associated with quality products. Therefore, this riding mower is among the best you will find out there. For starters, the mower is 19 HP/540cc-engine powered for strength and reliability to scale those steep patches in your backyard. Its automatic transmission makes it so much easy and fun to mow the lawn that you may be looking forward to it. 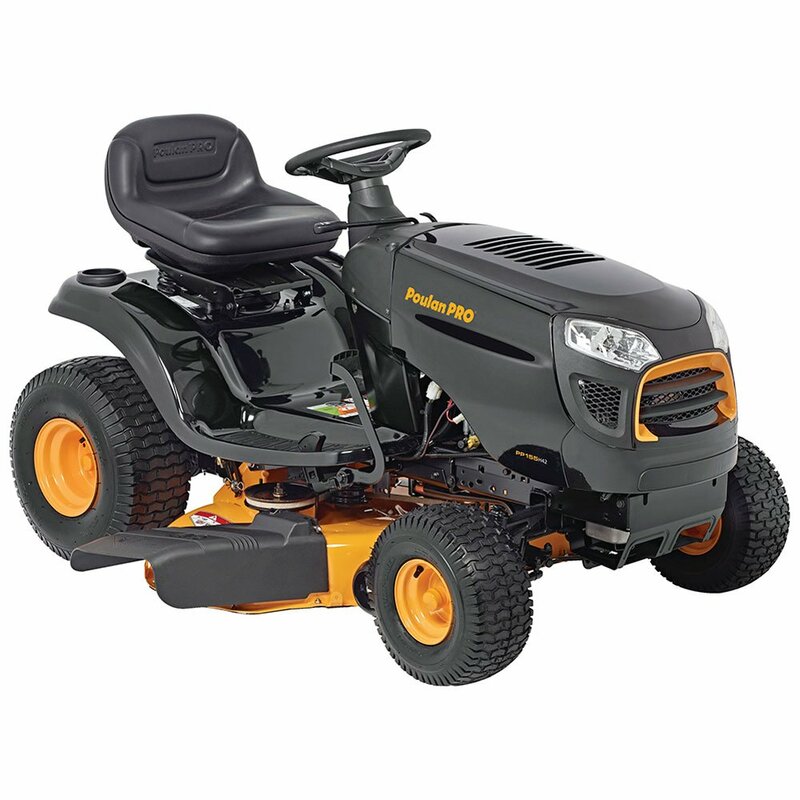 And for enhanced comfort when mowing, the product comes with a mid-back seat and soft touch steering. This is an attractive design mower that your neighbors will envy. The riding mower comes with a 42-inch deck that draws in air from above for efficient grass cutting. And make the adjustment of speed easy for you, the mower boasts an Auto Hydrostatic Transmission. 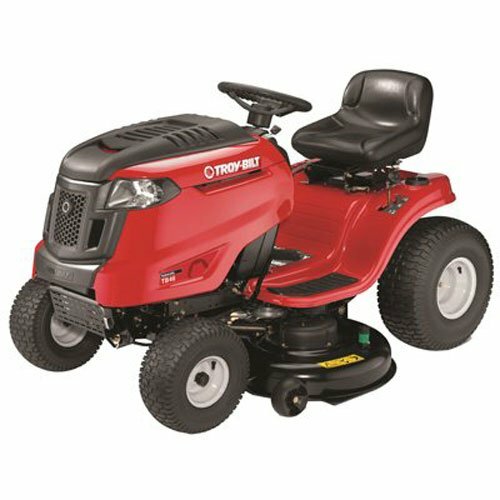 The mower has a 155 HP engine from Briggs & Stratton for durability and reliability – you will not need to worry about subpar performance or constant engine breakdowns. It has an oscillating axle that makes mowing on uneven terrain quite effortless. 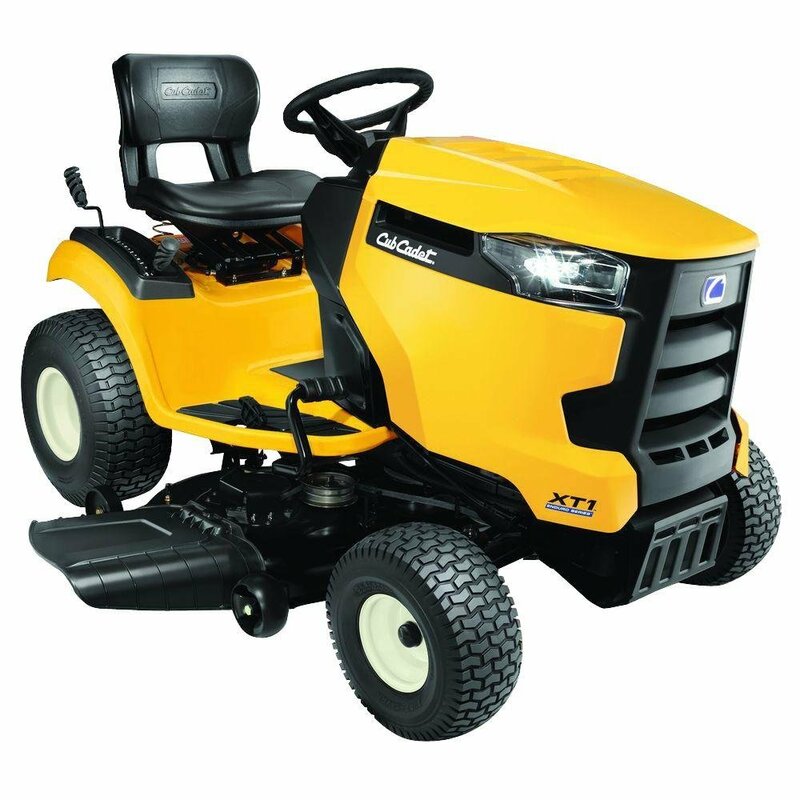 The Cub Cadet is another attractive looking riding mower that you may be proud using while the neighbors watch. It is packed with a powerful 24 HP Kohler engine to move up and the hill with much ease – no struggle here. The hydrostatic transmission makes driving the mower so much easier and pretty enjoyable – you just need to push the peddle and concentrate on the grass. The best riding mower makes your task of maintaining your lawn, a breeze. Riding mowers are all about speed, efficiency, and comfort. They transform a chore into a fun activity since you are not breaking a sweat. All the above mowers have all the features you would expect from them to make your mowing more comfortable. However, the best among them is Troy-Bilt Mustang 46 22HP 46-Inch Zero-Turn Mower. This mower has a robust 24 horsepower engine powerful enough to mow up the hill. The cutting deck comes with eight adjustable height settings and the best of all, it is zero-turn. That means you can comfortably mow the lawn around barrier without much ado.